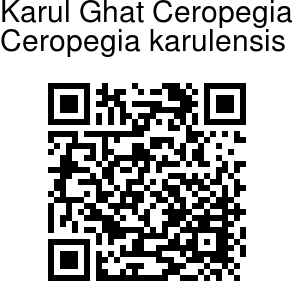 Karul Ghat Ceropegia is a newly described species, closely related to Law's Ceropegia. It is a tuberous erect or nearly erect herb. It is a tuberous erect or nearly erect herb. Tuber is 1.5-3 cm across, depressed spherical. Stem is unbranched, 27-77 cm tall, 4.-6 mm across, slender, sparingly hairy. Leaves are opposite; leaf-stalks up to 2.3 cm long, slender, deeply channeled above, hairy. Leaves are 3-12.5 cm long, 1.5-6.5 cm wide, basal bigger compared to upper, elliptic-ovate or lanceshaped, base somewhat heart-shaped, rounded or rarely oblique, tip tapering or abruptly tapering, sparsely hairy above, hairless below, secondary nerves up to 5 pairs, curving upwards, looping along the margin, emerging from leaf base. Flowers are highly fragrant, in umbel-like cymes, in leaf-axils or at branch-ends. Flower-cluster-stalks are up to 6.5 cm long, sparsely hairy. 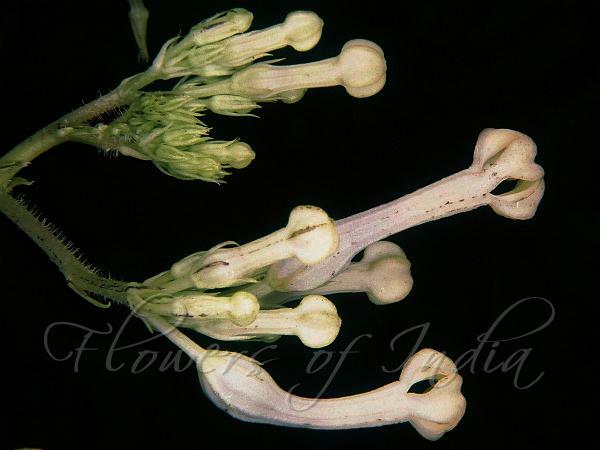 Flower-stalks are up to 8 mm long, Sepals are 5, subulate, up to 3.2 mm long, broader at base, hairless, 1-nerved. Flowers are up to 2 cm long, slightly curved or not, wither early; tube nearly cylindric, up to 1.5 cm long, up to 3 mm across, slightly wide at tip, whitish and minutely stiff hairy throughout outside, distinctly stripedd, dark reddish to purple inside in lower 2⁄3 part, distinctly dilated at base, dilated portion up to 6.0mm long, up to 4 mm across, ovoid, with hairs at base of inflated part. Petals are round or broadly elliptic, up to 5.2 mm long, up to 3.5 mm across, tip tapering, pure white inside and outside, hairless, fused at tips, forming a spheroidal head up to 6 mm across in the broadest part. Karul Ghat Ceropegia is endemic to Maharashtra, found mainly in the Kolhapur distt (Bhuibawda ghat, Karul ghat, Radhanagari) and Ratnagiri distt (Anuskura ghat, Machal hills). It grows in the cluster of grasses on the stiff hill slopes and also as undergrowth among Karvy shrubs, at an elevation of 400-900 m.